From the mind and programming skills of Julian Gollop, author of Chaos, came this masterpiece in 1988: Laser Squad, quite probably the best and most popular turn-based tactical game in the 80s. If you weren’t around at the time, you may not realize the sensation that Laser Squad was back then. 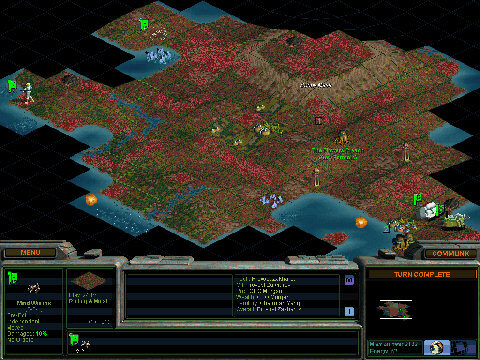 Even though it was a turn-based tactical game, it was, quite uniquely, accepted by many people who’d never touched a strategy game before. I was in school back then, and I remember the game being popular in my class, especially in its two-player mode — and I’m talking about kids (not that I wasn’t one, but I was always… kind of different 🙂 ) whose favorite genres were sports and driving games. Even later on, in the early nineties, the game was still popular among my friends — and, again, most of them didn’t have any interest in strategy games (except, in a few cases, Chaos… you may be noticing a pattern here). We’ve already seen two versions (MSX2 and PC) that appear to be based on this one. All of these are colorful, fast and smooth, but the sprites are smaller than average, the roads seem a bit “empty”, and the music, while decent, isn’t as good as that of most of the US Gold ports. 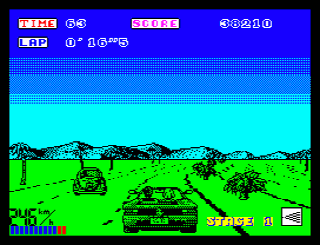 Still, in terms of “fun”, I’d rather play this port than any of the US Gold ones, except perhaps for the C64 one. Now we’re talking. 🙂 Have you noticed that, until now, we didn’t have even one Out Run port that looked and played like the original? Even on relatively powerful systems such as the Amiga? This one, however, succeeds. It’s fast, smooth, good looking, and really feels a lot like the arcade game. If there’s anything not great with it, it’s the music, which is again not as good as in most of the US Gold ports. 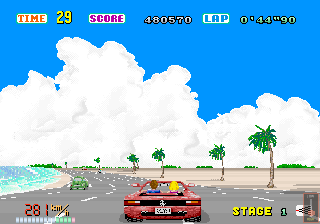 Considering that the PC Engine is an 8-bit console (though much more powerful than, say, the NES or the Master System, and able to compete with the 16-bit ones), this port, then, is easily the best 8-bit version of Out Run. Great port, isn’t it? Fast, smooth, great looking, and plays like Out Run. It’s hard to notice, as it’s so close to the PC Engine version, but the objects seem to be more detailed, the frame rate looks a bit smoother, and there appears to be a little more graphical detail. It would be hard to ask for a better port. Only the music — again — could have been better, but this is probably related to hardware limitations. No, it isn’t exactly the same game as the arcade, but it’s not that you’d expect such a thing in a home console at the time, right? (*) No, the Saturn isn’t used to the fullest, but, as mentioned in the intro, that’s OK as long as it’s a perfect port. 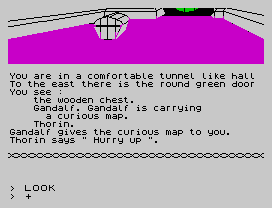 Back in time, to a 1982 game I played in 1983, on my first computer (well, technically my father’s), a 48K ZX Spectrum: Melbourne House’s The Hobbit. This game… well, it has a story, and I’m not talking about the “Bilbo, Gandalf and a bunch of dwarves go on a quest to retrieve a dragon’s treasure” one. I mean a personal story. I guess I could say that this game changed my life — as much as anything can change one’s life, I guess. 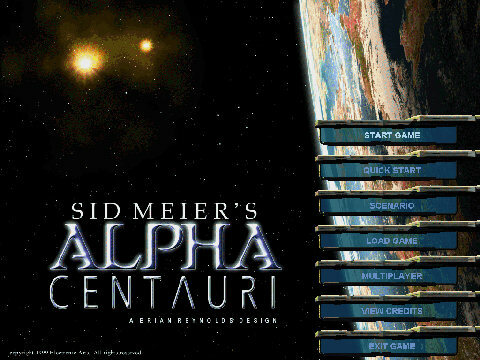 This game should have actually been named “Brian Reynolds’ Alpha Centauri”, but Sid Meier was (and is) the best known name, and it draws heavily on Meier’s original Civilization, so… Sid Meier’s Alpha Centauri it was (or “SMAC” to its friends). By Firaxis Games, distributed by Electronic Arts, shortly before the end of the last century. SMAC, believe it or not, is still a very popular game these days among strategy fans, and for good reason. In my opinion, it’s still the best Civ-style game, and has yet to be surpassed: Civ 4 was indeed a great game, and so is Civ 5 (though I can’t agree with a couple of design decisions), but, to me, SMAC remains the best Civ-style game. Unfortunately, it didn’t sell as well as it should have, possibly because most people — even most strategy buffs — aren’t science fiction fans, and it’s much easier to understand what you’ll get by inventing “The Wheel” or “The Alphabet” than what “Bioadaptive Resonance” or “Controlled Singularity” even are. In short, it scared away many Civ fans, which was a shame. style – the spartan ((no, I’m not referring here to the Spartans, a survivalist faction in the game :))) interface, the voices, the graphics, the sounds, the descriptions, the movies. It really made you feel like you were in a different, but viable world. personality – the Civ games’ leaders, even though they’re supposed to be real life ones, have little or no personality. SMAC’s had. A lot. Who can forget Chairman Yang, Lady Deirdre, Sister Miriam, or CEO Morgan? They actually have different goals in mind, and act towards them. They all speak in their own way. And they all have great quotes — all of them spoken in the game by the characters. a story – yes, a strategy game with one. Really. And it doesn’t always end the same way (and I don’t mean just because you lose the game in the middle). As I said, it’s still my favorite game of its kind, after 12 years. You can probably find the Planetary Pack (the game plus the expansion pack on a single CD) for sale somewhere, though it’s harder than it used to be. And you really should, if you’ve ever been interested in the Civilization series, or strategy games in general. Note, however, that getting it to run perfectly on modern Windows operating systems may constitute a challenge. Links: Wikipedia entry, Official site. A new Lords of Midnight for iOS (and others)? … and to be a collaboration between Chris Wild and Mike freaking Singleton, author of the original games in 1984. Again, these posts are from two days ago… or one day before my LoM post on this very blog. And I swear I hadn’t visited Icemark.com in years (I think last time I did, Chris didn’t even have a blog). If this isn’t a coincidence, I don’t know what is. Needless to say, I’m very excited about this. Especially because they’re promising that they won’t change genres, make it real-time, or anything else to screw up the game. Too many remakes or sequels lose sight of what made the original great (“oh, no, we can’t have a turn-based game in 2011, the kids wouldn’t have the patience…”). Posted on March 10, 2011 March 10, 2011 Categories iOS Games, Nostalgia, PC Games, Video Games, ZX Spectrum GamesTags Chris Wild, Mike Singleton, The Lords of Midnight4 Comments on A new Lords of Midnight for iOS (and others)? Do you like “The Lord of the Rings”? Tolkien’s epic, the best known fantasy book in the world? Did you enjoy Peter Jackson’s fantastic movie adaptations? If so, isn’t the idea of living the epic, even if “just” in a video game, tempting? If you want to re-live the movies, the best choice is Electronic Arts’ two games, “The Two Towers”, and, especially, “Return of the King”. They’re fantastic, whether on a console or on the PC ((this section was originally written in 2005; while those two games are still excellent, they probably won’t look as good 6 years later, with their “PS2-era” graphics, even on the PC. Another more recent choice is The Lord of the Rings Online, but that’s a different kind of game.)). But they’re movie adaptations – basically, you “play” the movies’ main battles, with the movies’ looks, the movies’ music, and the movies’ actors doing the voices. Those two are great action games, I’m not trying to diminish them in any way. Other excellent movie-licensed adaptations include the RTSs Battle for Middle Earth I and II — Christopher Lee and Ian McKellen are especially wonderful in the first one). 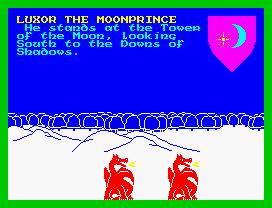 … there’s probably not a better choice than Mike Singleton’s 1984 classic, The Lords of Midnight. Nope, it’s not “Tolkien-licensed”. It’s not an official LotR adaptation in any way, though the inspiration is obvious. And Mike (formerly an English teacher) actually wrote a short novella, which was included with the game, and was a joy to read. But the game, a mix of adventure and strategy, was, 27 years ago, and is, right now, the best way to re-live Lord of the Rings — not an exploration of Middle Earth, not a meeting with Tolkien’s characters, but, instead, what Gandalf — who orchestrated the entire strategy — must have felt, and the challenges he had to meet. Lords of Midnight is the perfect, still unequaled blend of grand strategy – defeating, or stopping, or at least delaying the Dark Lord’s seemingly endless armies by force of arms – with high adventure – a heroic quest of a brave hero who attempts, without an army behind him, using only stealth and courage, to destroy the Dark Lord’s main source of power – which, obviously, can only be done deep inside the Dark Lord’s territory. Sounds familiar, doesn’t it? And that’s the beauty of the game: you control both lords with armies — think Aragorn, Théoden and such –, though you start with none and must recruit them, and individuals such as Morkin (the equivalent of Frodo, though here he’s really incorruptible, unlike everyone else), and other recruitable characters such as Fawkrin the Skulkrin (who would be the Gollum-equivalent) and Farflame the Dragonlord (an actual dragon, who moves faster than everyone else in the game and can easily, when rested, crush a 300- or 400-man army in one night, but can’t recruit troops). There’s also a complex hierarchy of “can-be-recruited-by” (which would get even more detailed in the sequel), which means that some lords can be recruited only by a couple of characters in the entire game. A LoM game is never short, unless you purposely screw things up, but it’s also never a forgettable experience. In your first few games you will really feel despair, because Doomdark’s (the Sauron-equivalent) armies seem endless (they aren’t), and recruiting a large enough number of lords to make a difference is far from easy. And your other option, Morkin’s quest, is virtually doomed to failure unless you put up enough of a military challenge to Doomdark to distract him ((which, you’ll note, once again parallels The Lord of the Rings…)). Really, play this game. There’s a reason why it still has an active community, with enhancements, remakes, multi-player versions and so on… after 27 years. By the way, the fact that the game isn’t played in real-time and doesn’t require precise controls makes it better than most other old games for playing (emulated) on a mobile phone. Back to the ol’ Speccy for a 1985 game I and my friends and brother played well into the late 90s: Chaos (also known as Chaos: The Battle of Wizards on the menu screen). Designed and programmed by Julian Gollop, who would go on to design such classics (not that Chaos isn’t one itself) as Laser Squad and UFO: Enemy Unknown (known outside Europe as X-Com: UFO Defense), this was indeed my first contact with a Gollop-designed game, though I didn’t know any of that at the time… after all, I was only an 11-year-old kid. Anyway, Chaos. By looking at screenshots such as the one next to this paragraph, it appears stupidly basic; by watching someone play without explaining to you what he or she is doing, it seems insanely complex. The reality? The options, however, are many. Should I cast this Giant when the spell has only a 20% chance of working? Should I cast it as an illusion, which works 100% of the time, but can easily be dispelled? Should I try to create easier, weaker Law creatures so that the Giant (a Law spell) is easier to cast later? Or should I go towards Chaos instead so I can eventually cast a Red Dragon? Is that guy going to attack me, or can I stay concentrated on killing that other guy? Can a Magic Bolt kill him next turn, or should I save it for when I’m threatened? He’s attacking with undead creatures, which can only be attacked by magic weapons or other undead, and I have none… should I cast a Magic Sword and fight them physically with my wizard? Trap them with Fire or a Gooey Blob? Create a Horse or a Pegasus, mount it, and get out of here? Create Magic Trees so I can get new spells? Is that Ogre he just cast an illusion? And all of that in 48 K. Yes, 49152 bytes. 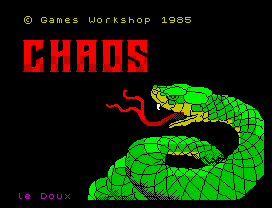 I must have played many hundreds of Chaos games in my life, almost all of them on a real ZX Spectrum, in the 80s and 90s. And even today the game is a lot of fun, especially with a group of friends. Oh, and the snake on the loading screen looked great. 🙂 I love how they circumvent the Speccy’s attribute clash and give the illusion of shading just by making some 8×8-pixel squares “bright” (the Spectrum could only have two colors each 8×8 square, thus the color clash, and the square could also have the “bright” bit optionally enabled, which is what they do here). As with most Spectrum games, you can get it (legally!) from World of Spectrum, in this case here. 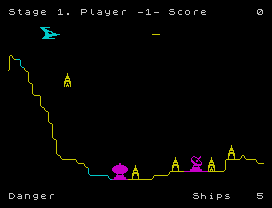 It’s basically a Scramble (an even older arcade game) clone – you fly a ship, which can shoot forwards, and drop bombs beneath you, with relatively good physics — they keep the inertia from your ship when it releases them. The first level takes place in open air, with just mountains to dodge, and missiles that try to hit you, but from the second level onwards, the game is inside increasingly complex caverns, so the ceiling is also a danger. And new enemies, of course (though not a lot of variety). Of course, the graphics seem laughable now, but reviews at the time said great things about them – they were impressive, for the time. Anyway, if you want to try the game yourself, it’s perfectly emulated.